Since this is a discussion about making Excel look better, a visual will probably be a quicker way to show what we can accomplish with a little bit of extra python code on top of the standard pandas library. One other point to clarify is that you must be using pandas 0.16 or higher to use assign . In addition there was a subtle bug in prior pandas versions that would not allow the formatting to work correctly when using XlsxWriter as shown below. Please make sure you have a version of pandas ( > 0.16) installed for this example to work. For the purposes of this article, I will be using data very similar to the ones described in Common Excel Tasks Demonstrated in Pandas. Let’s get started by importing pandas, numpy and xl_rowcol_to_cell . This dummy data shows account sales for Jan, Feb and March as well as the quota for each of these accounts. What we are going to do is summarize the data and see how close each account was towards hitting its quota. Get the number of rows to make it easier to add our Excel formulas a little later. As of pandas 0.16, there is a new function called assign that is useful here to add some total data. We can also use assign to show how close accounts are towards their quota. Save this data using the simple to_excel process. There is no total information. Overall it is pretty boring. With just a little more coding, we can create a more sophisticated output. We create another writer and use the to_excel to create our workbook. The key is to get access to the worksheet which enables us to use all the XlsxWriter capability available in that library. Now that we have the worksheet, we can do anything that xlsxwriter supports. If you have not done so yet, I encourage you to take a look at the XlsxWriter docs. 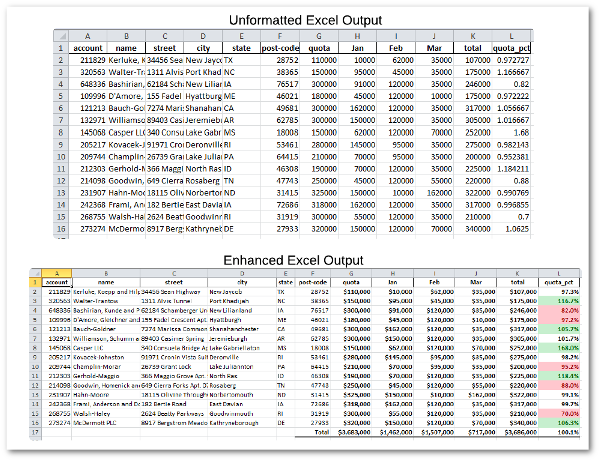 They are very well written and show you all the capabilities available for customizing Excel output. By accessing the worksheet as shown above, you can easily drop in all XlsxWriter’s features into your output. I’ll walk through a few of them to give you some ideas. First, we resize the sheet by adjusting the zoom. Some of our biggest improvements come through formatting the columns to make the data more readable. add_format is very useful for improving your standard output. # Add a number format for cells with money. This example shows how to add additional formatting including underlines. Change the size of several columns using set_column . This can also be used to apply formatting to a column. This section changes the size of columns B-F to sizes more appropriate for the data they store. In addition to changing the size of G-L, we also can apply the money and percent formatting on the entire column. The next section adds a total at the bottom of our data. The biggest challenge in working with Excel is converting between numeric indices and cell labels. This loop shows how to loop through the columns numerically but also use xl_rowcol_to_cell to get cell locations. The final item to add is the capability to highlight the top 5 values and the bottom 5 values. This gives us a nice visual representation of where we may need to inspect further. First, we define the range we want to format. Then, we define the colors. Finally, we apply the conditional formatting and save our output. There is much more to explore but this quick overview should give you some good ideas about making pandas’ Excel output that much more useful.